WinPatrol sniffs out worms, adware, keyloggers, spyware, cookies, and Trojan horses. This program puts you back in control of your computer with no need for constant updates. 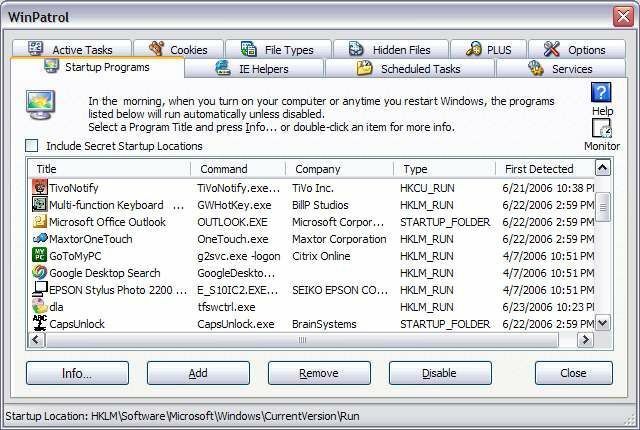 WinPatrol's goal is to help you better understand what programs are running on your computer and to alert you to any new programs added without your permission. Unlike traditional security programs, WinPatrol doesn't scan your hard drive searching for previously identified threats. Instead, it uses a heuristic approach, taking a snapshot of your critical system resources, then alerting you to any changes that occur without your knowledge.